This Manny Pacquiao, on this Saturday night, was not the Manny Pacquiao we saw last time he was in the ring more than a year ago. 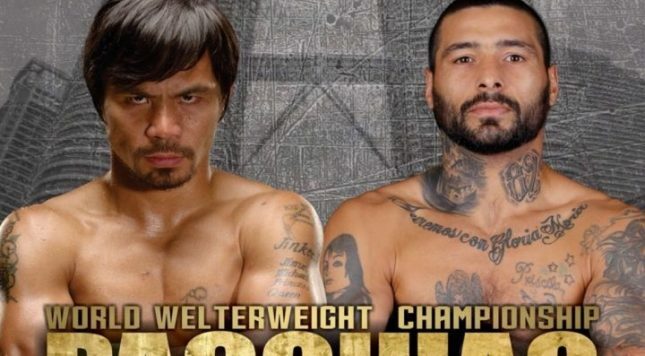 Nor was Lucas Matthysse the same kind of opponent as the last man Pacquiao faced. Nonetheless, those of us expecting an even further diminished Pacquiao — an older one, no longer training with his Svengali Freddie Roach, one in severe danger of losing — were way, way off. On ESPN+, Pacquiao absolutely throttled Matthysse, knocking him down three times before forcing Matthysse to remain on a knee and spit out his mouthpiece in the 7th. At 39, Pacquiao didn’t look slower or sloppier from ring rust or trainer switches. He came out fast, throwing quick combos and demonstrating footwork that at least echoed the Pacquiao of long ago. Now, Matthysse had something to do with that. Matthysse was never quick of hand or foot nor exceptionally skilled, and he didn’t pose any particular size obstacle as a guy who’s more of a natural junior welterweight. Jeff Horn, the man who didn’t deserve his win over Pacquiao last year, nonetheless gave Pac more trouble than Matthysse, thanks to being young, technically astute and physically larger (although the final reason got too much chatter; Pacquiao faced Margarito, who outweighed him by nearly 20 pounds, and had far less trouble than he did with Horn [admittedly one of the differences was age, but that goes to the earlier points, doesn’t it?]). Matthysse, by contrast with Pacquiao, looked like he had even less in his tank, and also slow and ragged. He only landed a handful of punches worth mentioning. No, wait. On second thought, let’s not even mention them. His vaunted power didn’t get to come into play because he didn’t really connect on much of anything. In the meantime, Pacquiao peppered the hell out of him with quick shots, not looking like the guy last year who was in poor shape, trying to conserve energy, disinterested, or all of the above, which helped swing the bad decision to Horn. An uppercut in the 3rd stunned and dropped Matthysse. Pacquiao, who hadn’t scored a knockout since 2009, didn’t really try to finish him. A 5th round shot on the temple for some reason made Matthysse take a knee. When he took a knee in the 7th, it was clear he didn’t want anymore. Pacquiao will get the choice of opponents he wants next time out, and despite his improved showing Saturday, they’ll want him right back, because he still has a name and can generate a paycheck. We must close on a sour note. The ESPN+ gambit generated plenty of grousing on Twitter from fans, as it should have. The production values were poor. The outlet isn’t widespread enough such that you can watch it on your TV without some jury-rigging or set-ups that not everyone has. Furthermore, and perhaps the ESPN-Top Rank deal that many vaunted as some kind of revolution has of late begun to feel like more of the same: pay to play. Some of the biggest stars that Top Rank has to offer have appeared on ESPN proper, like Terence Crawford and Pacquiao. But both those men — and, for what it’s worth, Horn — have had their last fight on a crappy app that requires a $4.99 a month subscription. Now, it’s not like there wasn’t a “yeah but you’ll have to pay” caveat that we got when this deal was signed. But if the best fights and biggest names are going to migrate to pay TV, then how much of a difference is this truly making? It should be clear after Saturday that this deal is not the deal that’s going to “save” boxing. I’m not sure what percentage of fights on ESPN vs the paid app will make it so this is significantly better than subscribing to HBO and Showtime, and how much more the audience on ESPN+ will shrink if x percentage of the best fights migrate from “free” ESPN (scare quotes since cable itself ain’t free). It’s almost like there’s a certain segment of boxing fans and boxing media who are either totally gullible, or else part of that alien mindset that Scotch-taping one’s allegiance to a specific promoter — as opposed to a specific fighter, or good fights, or just the sport itself — is somehow worthwhile or valid. And while Top Rank does plenty of good things as a promoter, well, it ain’t no panacea, or it probably wouldn’t be the longest-reigning promoter during the sport’s decline from its heyday.